BL series load banks are designed for permanent installation, suitable for harsh outdoor environments. Control arrangement and type is specifically designed for testing and exercising stand-by generators and UPS systems.Sephco load banks incorporate immersion proof and vibration proof stainless steel resistors. Safety features include the Sephco “Triple Interlock” load protection system, guarding against fan cooling failure, airflow restriction, high temperature and fan reversal. 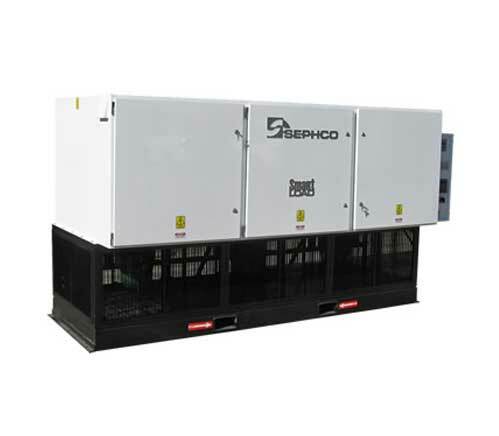 Unique features of Sephco load banks include circuit breaker protection for each load group and full accessibility to switchgear components and resistors. Installation of BL type load banks will ensure reliable back-up power from generators. Frequent exercising of generators will prevent wet stacking, cylinder bore glazing and reduce emissions. BL series load banks are supplied with full control facility, locally fitted to the load bank or supplied loose for remote control. Additional options include Modbus interface. BL0V….RTSW Style Load Banks from 25kW to 125kW capacities are fitted with a weatherproof rotary type selector switch for manual control of the load bank. The switch operation features fan-start and load step increments. A fan cool-down function is automatically activated when the load bank is shut down. Auxiliary terminals are included in the load bank connections for a remote dump function. The MC12PMB control panel is standard on all models from 150kW and higher. The control panel is supplied as an option on BL0V type load banks ranging from 25kW to125kW capacities. 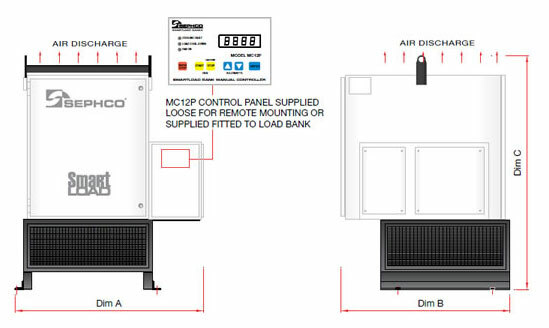 The MC12PMB controller is generally supplied loose for remote mounting however, can be supplied fitted to the load bank if required. The control panel features a touch type keypad and LED load display, with simple operation of the load bank start up, kilowatt selection and load bank status. The unit automatically configures the load steps in the load bank to provide instant kilowatt response as selected by the Up/Down keys. Other features include load bank “system check” which prevents loading in the event of fan cooling failure, fan reversal or high temperature. The control has additional inputs for a remote “Enable-Disable” signal andoptional Modbus interface. This entry was posted in BL TYPE. Bookmark the permalink.